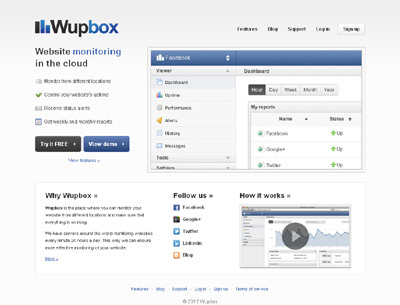 Wupbox is the place where you can monitor your website from different locations and make sure that everything is working. We have servers around the world monitoring websites every minute 24 hours a day. This way we can ensure more effective monitoring of your website. The web interface is very easy to use and everything is displayed graphically. The service displays more information about your website than other applications. Also you can receive alerts if your website is running slowly and taking a long time to load.